Yep. That’s the word that jumps to mind when I take a swig of this hale and hearty DIY pick-me-up. Have you tried Fire Cider? This potent anti-inflammatory, food-based elixir is a homemade concoction of immune-boosting, digestion-supportive herbs and roots that may very well take you that extra mile on the health train this winter. Recipes vary somewhat – you can play around with a version that appeals to your palate – but base ingredients typically include onion, garlic, ginger, turmeric, and your choice of citrus. 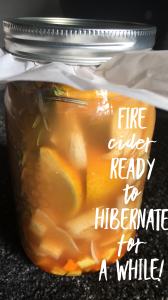 Fire cider is a restorative health friend. The formidable team of apple cider vinegar, garlic, onion, ginger and turmeric makes it a digestive aid powerhouse. Take a couple of tablespoons before meals to stimulate saliva and gastric juices or enjoy a nip post-eating to ease digestion. Active compounds in ginger and turmeric – namely, gingerol and curcumin – help reduce joint swelling, soreness and inflammation. Sulfur-containing allicin in onion and garlic is an effective anti-fungal. Oh, and a bonus: sulfur is a necessary nutrient to make collagen – our hair, skin, nails and joint angel. Flu and colds be gone! Hello Madame Energy! Chop ingredients and place in large glass (Mason; I used quart-sized) jar; stuff with sprigs of fresh herbs. Cover ingredients with apple cider vinegar, to within 1-inch of jar top. (If using a metal lid, be sure to cover first with parchment paper before securing lid – otherwise lid will rust from vinegar.) Place in dark cupboard for 4-6 weeks, shaking daily. Strain, then store your tonic in fridge. You may wish to add some raw honey for sweetness and to bring yet another layer of healing antioxidants to your quaff. Will last for months! Drink straight-up or add a tablespoon or to a cup of bone broth, green juice or your water bottle!